These Crock Pot Beefy Hearty Beans are a great way beef up a weeknight dinner. They can be prepped the night before and cook all day! 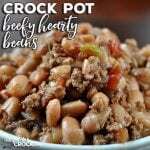 You can serve these Crock Pot Beef Hearty Beans up with a slotted spoon for a delicious side or with a ladle for a yummy soup! I used my 6-quart Programmable Travel Crock Pot. It was the perfect size for this recipe.